Here is my submission to the Weekend Sketch Challenge, hosted this week by the very talented Charmaine at Oodabug Alley! 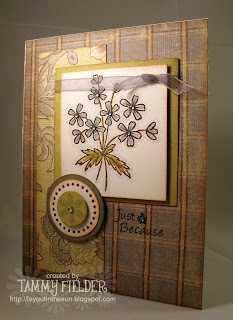 I used designer paper by Wild Asparagus (MME) from their "Grandpa" line. I just love the colors! The main floral image stamp is from Hero Arts, the sentiment stamp is from Studio G, and the circle dot and little flower stamps are both from Stampin' Up's "Think Happy Thoughts" set. The card took longer than I thought to make, but then again, it's the first card made in my new craft space! I will be much more efficient as I get used to where I put everything! Tammy, this is GORGEOUS! I LOVE those papers and colors! Just delicious! Thanks for playing with the sketch!